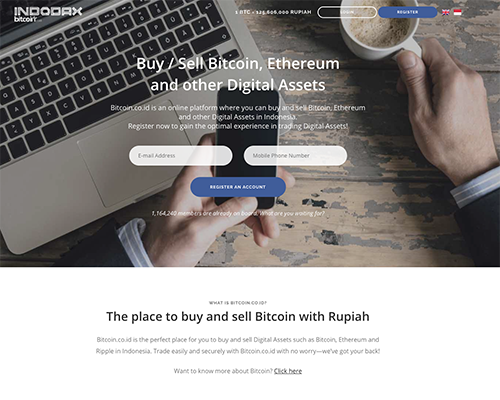 Indodax (Bitcoin Indonesia) is an Indonesian cryptocurrency exchange that launched in 2013. It offers its services worldwide, but accepts deposits in Indonesian Rupiah only. Indonesia’s largest bitcoin exchange. Indodax claims to have over 570 000 clients and a daily volume of over half a billion Rupiah. There are several other cryptocurrency exchanges operating in Indonesia, including the Local Bitcoins P2P platform. Indonesia is a considered an “emerging economy” and is a member of the Group of Twenty (G20) largest industrialized economies. Large Instrument portfolio. Indodax offers spot trading in Bitcoin, Ether, Dogecoin, Litecoin, Nubits, Paycoin, Ripple, Bitcoin Cash and DarkCoin. This is a fairly good selection of alt-coins, while some exchanges offer trading in Bitcoin only. Reasonable trading fees. Indodax trading fees are in the average for the industry. There are, of course, exchanges that charge 0% fees, but they either offer worse prices of the assets or charge hefty transfer fees. There are also exchanges that have much higher trading fees, in the range 1-7%. No fees for trading in cryptocurrencies. The aforementioned 0.3% fee is for trading between cryptocurrencies and fiat currency. For trading between alt-coins, there is no fee. Bank wires accepted. Indodax accepts fiat currency deposits and withdrawals via bank transfer, cash and vouchers. The accepting of cash payments is fairly rare for cryptocurrency exchanges and we can only think of a handful of such platforms. No limits. Indodax does not impose any limits on fiat currency deposits, i.e. there is no minimum and maximum. Bitcoin wallet available. Indodax offers own cryptocurrency wallet, which can be used to store alt-coins or to send them elsewhere. There is also a mobile app for it. Spot Bitcoin markets. Clients of the exchange can buy or sell Bitcoin for their own price, using the “Bitcoin Spot Market” feature. The order can be canceled at any time before being fulfilled. Low transaction minimums. Indodax has very low requirements for trade sizes. In order to buy Bitcoin (well, a fraction of it), one needs IDR1000 (USD 0.07) and the minimum sell size is 0.001 BTC. Trading platform. Indodax’s platform is simple and intuitive to use, and even though it does not offer the usual features of a fully-fledged trading platform, like analysis and charting tools, has everything necessary. Mobile app. There are not many cryptocurrency exchanges who have a bespoke mobile trading app, but Indodax does. This is a major convenience for users who want to trade on the go or keep an eye on their transactions. Fiat currencies. Indodax accepts the Indonesian Rupiah as the only fiat currency. It says it also works with overseas bank accounts, but notes that the bank transfer fees can be very high. This in practice means that the service is not very easily accessible, or to put it frankly, cheap for people living abroad. Either way, obviously Indodax is targeting the Indonesian market mostly. Withdrawal limits. Indodax, similarly to many other cryptocurrency exchanges, has daily withdrawal limits. There are also limits in case one is withdrawing cash in the company offices. Withdrawal fees. Indodax charges clients withdrawal fees, for all methods, including cash withdrawal in the company office. The fees vary greatly, depending on the type of withdrawal. There is also a withdrawal fee for cryptocurrencies. No leveraged trading in cryptocurrencies. - Similarly to the majority of cryptocurrency exchanges, Indodax does not offer leveraged trading. However, there are some exchanges who do, like Kraken, GDAX (institutional), CexIo, Quoinex. There are also forex brokers who offer leveraged trading on cryptocurrency CFDs, even though they are highly risky instruments. No regulation. As most other cryptocurrency exchanges, Indodax is not regulated. This is relative, however, as most countries still do not have explicit legal framework and regulation requirements for cryptocurrencies and exchanges. Most of the major cryptocurrency platforms work hard for their good reputation, but as with forex brokers, there are some that are scam. There are also the victims of hacker attacks, like the infamous Mt. Gox that went bankrupt and Bitfinex. Indodax is the largest cryptocurrency exchange in Indonesia and enjoys good reputation. Apparently it is targeting mostly Indonesian users, but the country is the fourth most populous in the world, so it is a big market. We like the fact that the exchange offers more than just bitcoin, but other popular cryptocurrencies as well. As we have already said, the fiat-cryptocurrency trading fee is in the average for the industry and the company does not charge commission for trading between cryptocurrencies. We also like the fact that there is a mobile trading application, which is a major advantage before other platforms and a great convenience for users. The main drawback is that Indodax is that it only works with IDR, but, then again Indonesia is its primary market.